"Singularity enables users to have full control of their environment. Singularity containers can be used to package entire scientific workflows, software and libraries, and even data. This means that you don’t have to ask your cluster admin to install anything for you - you can put it in a Singularity container and run." Singularity allows you to avoid this time-consuming series of steps by packaging these commands in a re-usable and editable script, allowing you to quickly, easily, and repeatedly implement a custom container designed specifically for your analytical needs. 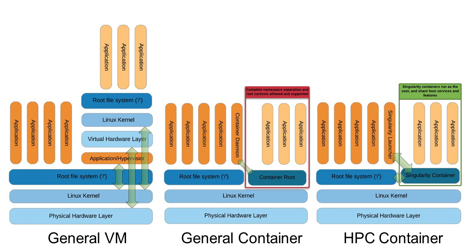 The diagram below compares a VM vs. Docker vs. Singularity. Next, let's get some hands-on experience with Singularity. The following tutorial includes links to asciinema video tutorials created by SDSC HPC Systems Manager, Trevor Cooper (Thanks, Trevor!) which allow you to see the console interactivity and output in detail. Look for the video icon like the one shown to the right corresponding to the task you are currently working on. This may take several seconds depending on your computer. You should be prompted to enter your admin password. The process of building a Singularity container consists of a few distinct steps as follows. We will go through each of these steps in detail. We recommend building containers using the same version of Singularity, 2.5.1, as exists on Comet. This is a 2 step process. Bootstrapping a Singularity container allows you to use what is called a ‘definitions file’ so you can reproduce the resulting container configurations on demand. Let’s say you want to create a container with Ubuntu, but you may want to create variations on the configurations without having to repeat a long list of commands manually. First, we need our definitions file. Below is the contents of a definitions file which should suffice for our purposes. To bootstrap your container, first we need to create an empty container. This may take a while to complete. In principle, you can accomplish the same result by manually issuing each of the commands contained in the script file, but why do that when you can use bootstrapping to save time and avoid errors. If all goes according to plan, you should then be able to shell into your new Ubuntu container. You may create a free account on the XUP if you do not already have one and then proceed to submit an allocation request at the above link. Once you have created your container on your local system, you will need to transfer it to Comet. There are multiple ways to do this and it can take a varying amount of time depending on its size and your network connection speeds. To do this, we will use scp (secure copy). If you have a Globus account and your containers are more than 4 Gb you will probably want to use that file transfer method instead of scp. The container is ~805 Mb so it should not take too long, hopefully. Next, you should submit a request for an interactive session on one of Comet’s compute, debug, or shared nodes. Once your request is approved your command prompt should reflect the new node id. This allocation requests a single node (-N 1) for a total time of 10 minutes (-t 00:10:00). Once your request has been approved, your computer node name should be displayed, e.g. comet-17-12. Notice that the command prompt has now changed to reflect the fact that you are on a compute node and not a login node. If all goes well, you should see “Hello, World!” in the console output. Of course, most users simply want to submit their jobs to the Comet queue and let it run to completion and go on to other things while waiting. Slurm is the job manager for Comet. Below is a job script (which we will name singularity_mvapich2_hellow.run) which will submit your Singularity container to the Comet queue and run a program, hellow.c (written in C using MPI and provided as part of the examples with the mvapich2 default installation). The above script requests 2 nodes and 24 tasks per node with a wall time of 10 minutes. Notice that two modules are loaded (see the line beginning with ‘module’), one for Singularity and one for MPI. An environment variable ‘CONTAINER’ is also defined to make it a little easier to manage long reusable text strings such as file paths. SDSC User Support staff, Marty Kandes, has built several custom Singularity containers designed specifically for the Comet environment. Learn more about these containers for Comet. The resulting container should be named something like singularity-hello-world.img. That's it! Congratulations! You should now be able to run Singularity containers on Comet either interactively or through the job queue. We hope you found this tutorial useful. Please contact support@xsede.org with any questions you might have. Your Comet-related questions will be routed to the amazing SDSC Support Team. One of the more common advantages of using Singularity is the ability to use pre-built containers for specific applications which may be difficult to install and maintain by yourself, such as Tensorflow. The most common example of a Tensorflow application is character recognition using the MNIST dataset. You can learn more about this dataset at http://yann.lecun.com/exdb/mnist/. XSEDE's Comet supercomputer supports Singularity and provides several pre-built container which run Tensorflow. Below is an example batch script which runs a Tensorflow job within a Singularity container on Comet. Copy this script and paste it into a shell script named "mnist_tensorflow_example.sb". Congratulations! You have successfully trained a neural network to recognize ascii numeric characters.